Try our web app calculator! Does your business really have to take the cost and responsibility of employment if you can get a task completed by an expert for considerably less cost? If you already employ or you are considering recruiting, have you calculated the true cost of employing? 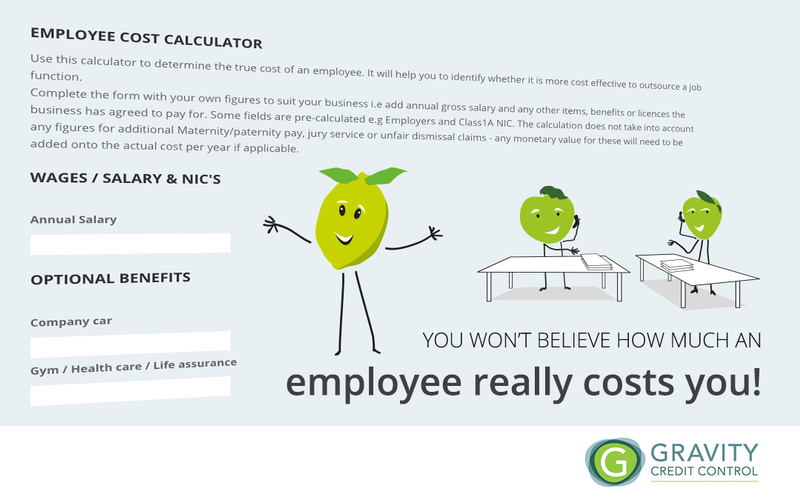 Use our Web App calculator to see how much just one employee really costs your business. So what is the alternative? Outsourcing used to be a dirty word and today it still comes with many misguided preconceptions but recently the majority of UK businesses, large and small, are now realising that outsourcing does not mean sending portions of your business abroad and losing control. In fact, outsourcing has been proven to pass on huge benefits from its processes and economies of scale. So why outsource your credit control? There are many excellent reasons to outsource your credit control which include results, flexibility, expertise, customer satisfaction and service provision. Here I deal with the cost element as one of the major and over-riding contributing factors. It will immediately give your budget a break and your cash flow a boost. Outsource to a trustworthy, confidential and competent service and you can set and control your budget by paying only a fixed monthly fee. By contrast, with in-house employees, you have to account for overheads that go way beyond their basic salaries. Savings are also achieved in many areas of the business, not just the department in question. For example, a business will have a reduced exposure to employment law, the saving of recruitment costs, reduced HR and IT tasks, payroll administration, employment tribunals and even from lower occupancy and overhead costs resulting from a smaller headcount. Let’s say, for this example, the average credit controller outside of London is paid a salary of £19500. On top of the employee’s main salary there would be a minimum of 28 days holiday, 13.8% on top of wages for employer’s national insurance contributions, a desk, computer, stationery, ongoing training, HR & payroll time and management time – all this needs to be factored into costs. Remember also that when you are paying an employee holiday pay, the job has to be covered by someone else or not covered at all – not the case with outsourcing as the provider takes on this responsibility too. With the introduction of workplace pensions and increasing employment costs can you afford not to consider using outsourced specialists?